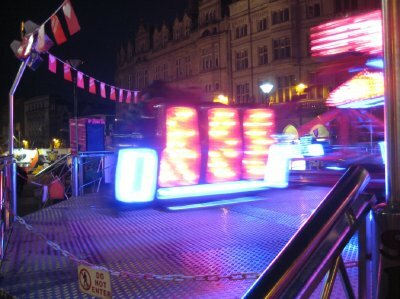 Sheffield comes alive with rides, music and food to entertain the kiddies on their school break. 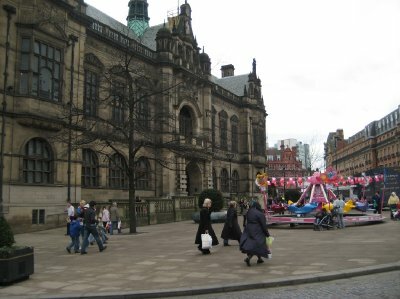 This week is half-term up in Sheffield, which is a late winter school break for the children. It is like the March Break I used to have back in Canada, but with less March and more February. 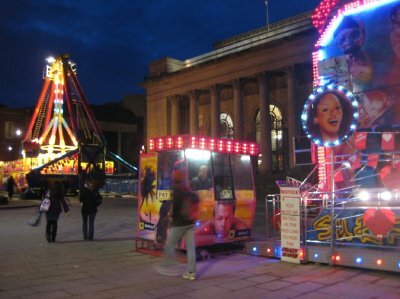 To entertain the little kiddies (thus keeping the parents sane) and keep the older ones occupied so they don't turn into ASBO hoodies, Sheffield has put up a bunch of carnival rides in the city centre, with rides in Orchard Square, the Peace Garden, Barker's Pool and outside town hall. I work right by the city centre, and the building we work in seems to be heated by the power of 1,000 fusion reactors, so we all keep the windows open. As such, I have spent the week at work listening to the sound of rock music blasting from speakers and kids screaming with delight at the rides. I can't complain, though. After all, my own six-month long half-term break just ended a month ago. 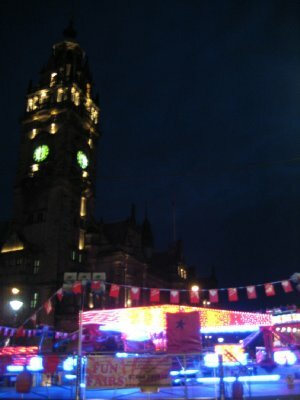 Here's some photos from the carnival, as well as some shots of Sheffield's city centre at night. Tickets! Get your Tickets! Tickets! Busy shoppers rush by the rides. Come on, folks, stop and have some fun! Spinning! Lots of screaming from this one. 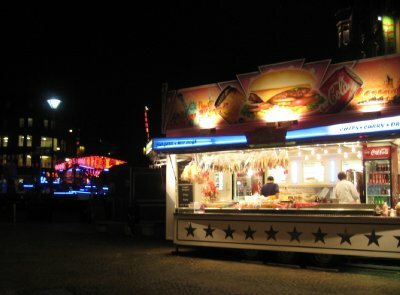 Burgers, hot dogs, fish and chips. Just don't go on the rides right after eating. 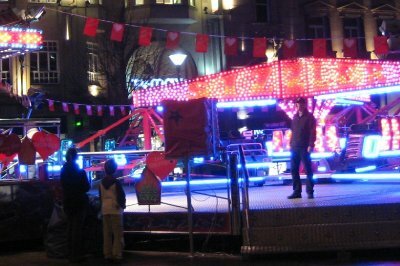 The youngest even get a fun airplane ride right by town hall. 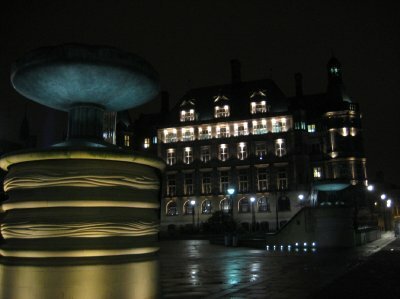 The fountains in the Peace Garden, with the town hall in the background. Green space in the Peace Garden, taken last week, when there was still some snow on the ground. Luckily for the kids on half-term, the weather this week is much nicer, with temperatures almost up to 10 C late in the week. 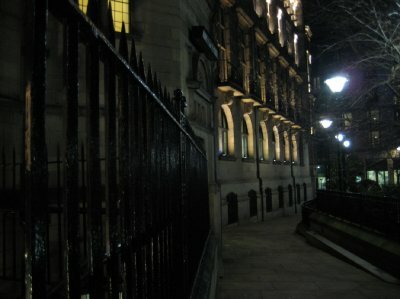 Town hall with wrought-iron fence. 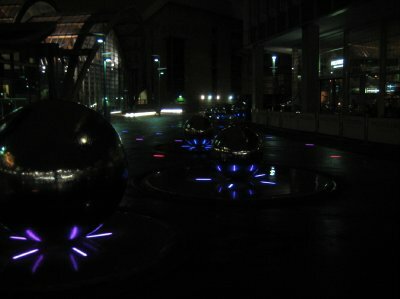 Stainless steel balls, covered with running water and lit up from underneath by neon lights. 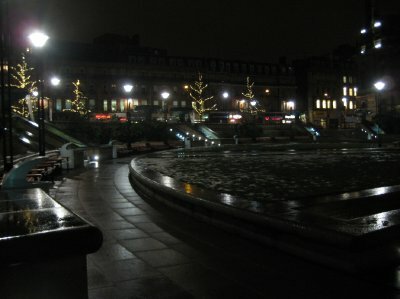 Millennium Square. 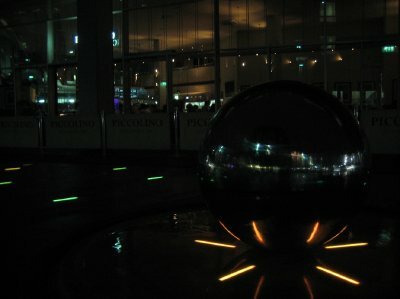 Millennium Square again, with more of the balls visible. You can see the Winter Garden greenhouse in the background. I'll write more on that in a future entry. 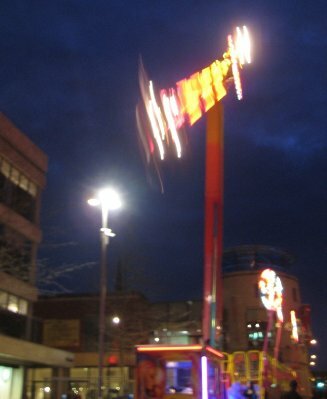 Spinning round and round on the Sizzler. Working on loading up the Sizzler. 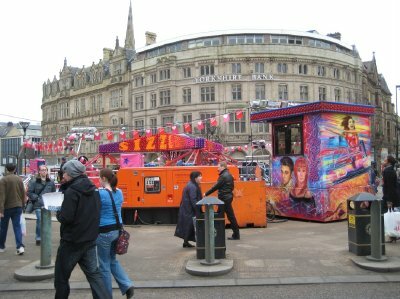 I love the incongruity of the gaudy rides in that beautiful town square. How fun!